France began exploring and attempting to colonize North America in 1534, when Jacques Cartier (1491-1557) first sailed up the St. Lawrence River. After bumping against the British who were busy trying to do much the same thing the French were doing (and those silly Indians who thought they were there in the first place) for a couple hundred years, by the 1730's France had by far the biggest share of the New World, extending from New Orleans in the south to modern-day Saskatchewan in the northwest, and the Labrador Coast in the northeast. 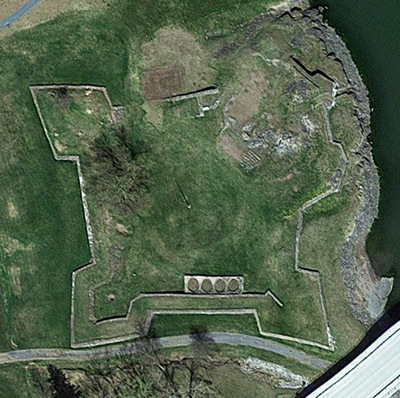 The French first built Fort St. Frédéric at Crown Point at the narrow southern end of Lake Champlain in 1734, across the water from what is today Vermont, to solidify their hold on this area that was on the border with British-held territory. It was the first such fortification built in the Champlain Valley, and gave the French uncontested control of the region until 1755. Should you be so inclined, you can read more about Fort St. Frédéric at the bottom of this page. 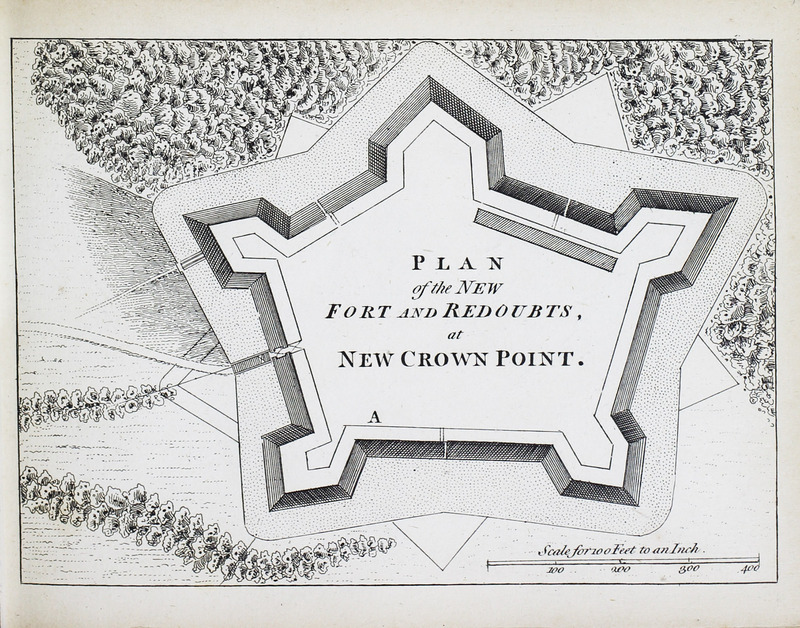 An engraving of Fort Crown Point, based on an engineer's plan, which appeared in a 1763 London publication. The French and Indian War (1754-1763) brought more British attention to Fort St. Frederic than the French may have wanted, in the form of an attack in 1759 by around 12,000 British and provincial troops, which resulted in British possession of the fort. Under the command of Sir Jeffery Amherst (1717-1797), the British began furiously building His Majesty's Fort of Crown Point into a vast complex including an expanded fort, blockhouses, redoubts and roads. The building continued, at times employing as many as 3000 builders, until the war ended in 1763 and construction abruptly stopped. 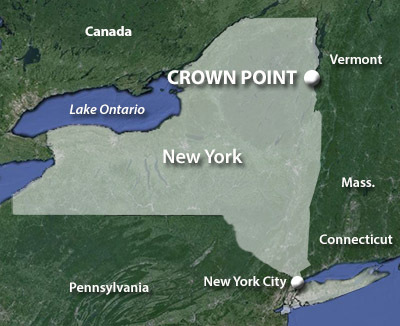 Crown Point sat midway between Montreal and Albany, and served as the center of communication between British possessions in Canada and New York. A chimney fire in a soldier's barracks spread to Fort Crown Point's powder magazine in April 1773, causing what must have been a large noise indeed, plus the destruction of much of the main fort. The British allowed troop strength to dwindle down until there was just a tiny garrison left to surrender the fort to American troops on May 12, 1775, when the American Revolutionary War (1775-1783) had gotten underway. Over 100 British cannon were captured with the fort, which proved useful in March of 1776, when they and cannon from Fort Ticonderoga (captured by American forces two days before Fort Crown Point was taken) were used to drive the British out of Boston Harbor. US General Benedict Arnold (1741-1801), though known today by all Americans as a traitor who joined the British during the Revolution, spent the majority of the war being one of the most effective fighting leaders that America had. Indeed, in the excellent book Rabble in Arms by Kenneth Roberts, Arnold is portrayed in a particularly heroic, almost godlike fashion. Twas Arnold who was responsible for the capture of Fort Ticonderoga, and in October 1776 he led the fledgeling US Navy into its first action at the Battle of Valcour Island, the vessels for which had been built at Crown Point over the previous four months. The ruins of Fort Crown Point's interior buildings. Arnold's little US fleet was almost completely destroyed by the Royal Navy under the direction of Sir Guy Carleton (1724-1808), but the battle served to delay Carleton's force from their planned recapture of Fort Ticonderoga that year, which allowed the beleaguered American army to escape what would have been a decisive defeat. The Americans abandoned Crown Point to the advancing British in 1777. Fort Crown Point remained under the control of the crown until the end of the war, granting the King's minions absolute control of Lake Champlain until the Treaty of Paris in 1783. Fort Crown Point was named a National Monument in 1968, and today protects Crown Point Campground from an invasion by the dastardly Vermontese. 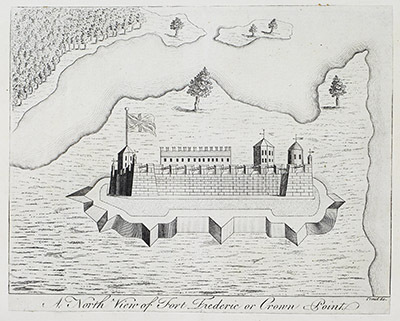 The first fortification built at the head of Lake Champlain was Fort St. Frederic. It was built by the French from 1735 to 1737 and named for the minister of France's colonies in the New World, Jean-Frédéric Phélypeaux, Count of Maurepas (1701-1781). I think at this point we're all breathing a sigh of relief that it wasn't named Fort Phélypeaux. 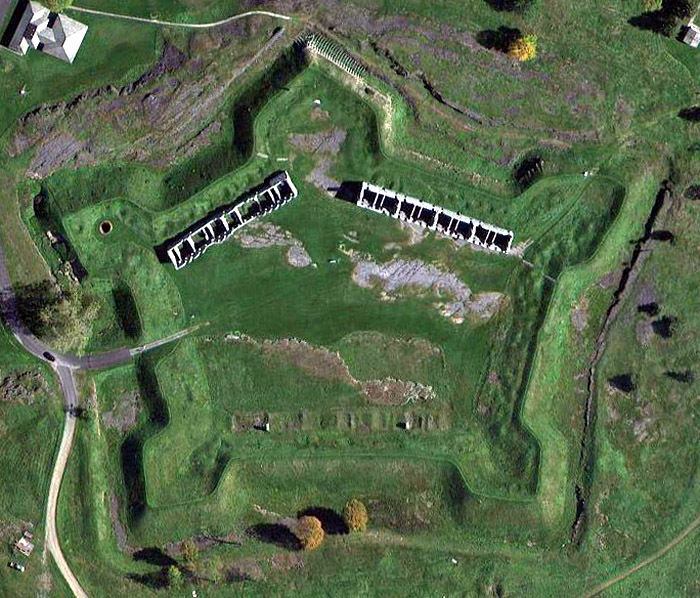 Fort St. Frédéric was a 300-foot square stone fort that was built to mount 62 guns, with a 100-man garrison. Three of the fort's six bastions protected its citadel, an eight-sided, four-story tower, whose walls were twelve feet thick at its base. The French and Indian War (1754-1763) brought the British to Fort St. Frédéric on three occasions. The first two somewhat half-hearted British attempts to capture Fort St. Frédéric, in 1755 and 1758, were unsuccessful. The French themselves partially destroyed the fort and scampered into the wilderness in 1759, however, having received news that a force of 12,000 men under Sir Jeffery Amherst were on their way for a third try. 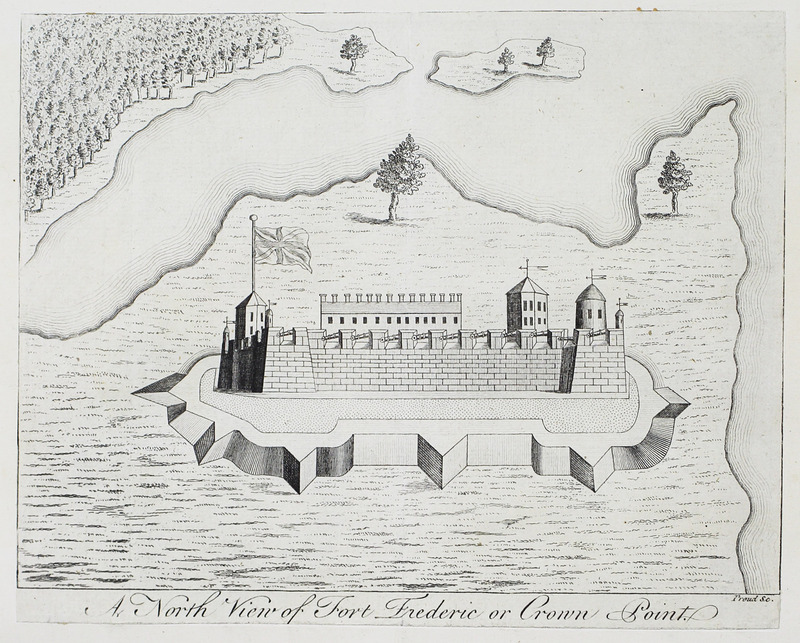 A fanciful engraving of Fort St. Frédéric that appeared in a London magazine in 1759. While the fort's distinctive tower is kind of accurately rendered, the rest is based on the artist's imagination. Amherst oversaw the destruction of the rest of Fort St. Frédéric, and the much larger Fort Crown Point was built right next to it. Despite having been intentionally destroyed, there seems today to be almost as much of Fort St. Frédéric left as there is of Fort Crown Point! Here's what it really looked like. Maybe. 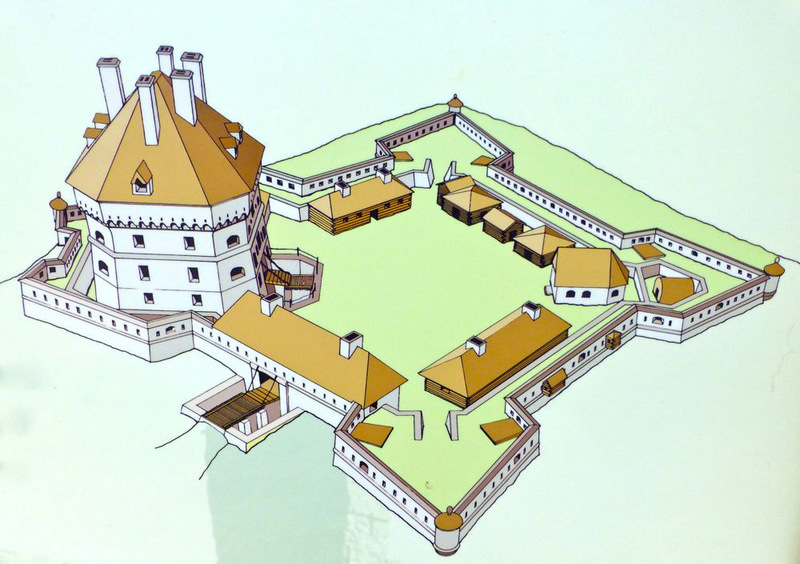 This seems like a more reasonable representation of Fort St. Frédéric, although having seen the remains of this fort in 2016 my own self, the scale seems impossible. This fort must have been way smaller than this. Still, it's a very pretty representation. And one does hate to be picky. I visited Fort Crown Point and Fort St. Frédéric in August of 2016. Won't you read of my adventures in the Starforts I've Visited section? I promise, it's not about me, but the starforts.